Lyons, Mill City, and the entire Santiam Canyon Area. 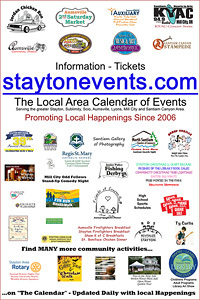 100% of net ticket sale proceeds on staytonevents.com go to event organizers. Any fees that may be included in the online price are at the election of the event organizers to help cover PayPal and credit card fees. Contact us for help with online AND onsite promotion of your local activity! Bring some fun and attention to your Fundraiser - Performance - Grand Opening - Open House - Customer Appreciation Day - Business Anniversary - Vendor Event - ?? 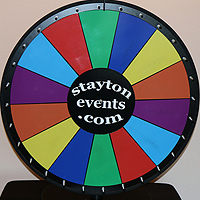 Contact staytonevents@wvi.com to get one on your event table or business counter! Mentioning to your friends on Facebook about information that can be found here, with the link to www.staytonevents.com is appreciated, but please don't just republish my work content on someone else's multibillion dollar commercial website. Bird & Hat Inn & Snow! April 1, 2019 - Stayton, OR - staytonevents.com announces our third, Santiam Gallery of Photography - Photography Exhibition and Contest. This 2019 edition of the Gallery includes some exciting changes including exhibitions at multiple locations and events, and changes to the entry and judging rules. The contest is open to photographers of all abilities from professional to student. All interested photographers are encouraged to enter and should check the new rules and entry form now. Look for more information on the Santiam Gallery of Photography exhibitions soon on the Local Area Calendar of Events below. Update: Exhibitions at Stayton 4th of July Celebration and Sublimity First Tuesday in the Park (August) are now confirmed, with other events yet to be announced. thanks to all our staytonevents.com supporters! If you do not see a particular local event or activity you are looking for listed in the calendar of events, it is because the sponsoring organization has not yet contacted us for this year, or they have chosen to not have us help promote their event. Santiam Valley Grange Easter Egg Hunt, 1pm, Santiam Valley Grange, 1140 5th Street, Lyons. Admission is free. Kids will be separated into age groups to make it easier for the children (0-1, 2-3, 4-6, 7-12). Start time is 1pm so get there early find your age group and be ready to hunt eggs. AA/Big Book Meeting, 6pm, New Life Foursquare Church, 1090 N First Avenue, Stayton. Motion Monday, 10:15am, Stayton Public Library E.G. Siegmund Room, 515 N First Avenue, Stayton. Get up and move to the beat of our favorite children’s tunes! This program is for children and family members of all ages. AA Meeting, 7pm, New Life Foursquare Church, 1090 N First Avenue, Stayton. Family Storytimes, 10:15am, Stayton Public Library E.G. Siegmund Room, 515 N First Avenue, Stayton. Come explore the world of early literacy through songs and rhythms, stories and rhymes. This program is for children and family members of all ages. Undercover Storytimes, 3pm, Stayton Public Library E.G. Siegmund Room, 515 N First Avenue, Stayton. Join us for secret stories and activities and maybe find your “just right” book. This program is for school age children. Be sure to join us for this fun evening of community celebration. Check here for full event details and award winners to be announced prior to the event. Book Discussion - "The Curious Charms of Arthur Pepper", 5:30pm, Stayton Public Library E.G. Siegmund Room, 515 N First Avenue, Stayton. Join us for our monthly book discussion group for adults. This month’s book is The Curious Charms of Arthur Pepper by Phaedra Patrick. Sublimity Quilters Gathering, 9am-3pm, St Boniface Church Rectory Basement Hall, 375 Church St, Sublimity. Sublimity Quilters is a charitable working group that meets weekly making quilts and comforters for local schools, Birthright of Salem, and other projects brought to their attention. New members are welcome. Cathy Lamb - Stayton Public Library Author Series, 7pm, Stayton Public Library E.G. Siegmund Room, 515 N First Avenue, Stayton. Oregon resident Cathy Lamb is the author of 12 novels including: Julia's Chocolates; No Place I'd Rather Be; What I Remember Most; The Last Time I Was Me; Henry's Sisters and her latest, The Man She Married. A reception for the author will accompany the presentation. The Stayton Public Library’s speaking events are made possible by Stayton Friends of the Library. Free Admission - Free Parking - Free Inspiration! Come on out to the 46th Annual Linn County/Albany Spring Home and Garden Show, your local one-stop-shop for anything you could need for your home improvement, garden, or yard! Dream about your backyard as you tour the demo garden, meet landscapers, ask questions of the Master Gardeners, and buy plants at the area's biggest spring plant sale. The Home Show bursts at the seams with home improvement ideas and tips from the local experts, so bring your home remodel questions for builders, designers, and an architect. This event is not only free but offers lots of vendor giveaways, big and small including a backyard patio & firepit sponsored by S&A Hardscapes and a queen mattress from Mattress World NW. The kids will enjoy the learning and play areas and you can browse booths selling chic home decor or tour the tiny home showcased by Fitzpatrick Painting and Construction. Come and get thousands of Home decorating and improvement ideas from the largest hub of building and remodeling resources in the area. This weekend the Albany Spring Home & Garden Show is the place to be. BabyTime!, 10:15am, Stayton Public Library E.G. Siegmund Room, 515 N First Avenue, Stayton. Give baby a taste for early literacy through movement, songs, rhymes and play. This program is intended for infants up to 18 months and their caregivers. Star Wars Breakout!, 6pm, Stayton Public Library E.G. Siegmund Room, 515 N First Avenue, Stayton. BB-8 has been kidnapped. Work with your team on a rescue mission to solve puzzles to unlock poor BB-8. For teens in grades 6-12. AL-Anon Meeting, 7pm, New Life Foursquare Church, 1090 N First Avenue, Stayton. AL-ANON is a support group for families of alcoholics. Discuss and share common experiences with the goal of building on the positives. Order Your Bark Dust Today! One load is approximately 2.5 cubic yards - front loader scoop. Listed prices include all credit card fees and delivery charge, where applicable. Don't forget to include your contact phone number in the space provided below so you can be called day of delivery. All transactions are securely processed by PayPal but you do NOT need a PayPal account. Neither Stayton Lions Club or staytonevents.com will receive, or have access to, your credit card information. All orders are forwarded to Stayton Lions Club for processing. 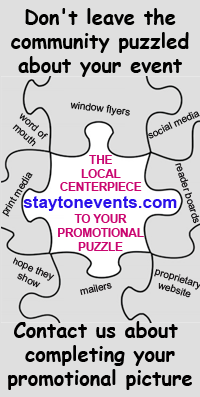 100% of net sales on staytonevents.com go to event organizers. You are cordially invited to the Annual Regis St. Mary Evening at the Auction. This year's theme is Cuba Noche and we hope you will enjoy a little taste of the Cuban culture - from the music and food to our new signature drink! Doors will open at 5pm and dinner will be served at 7pm. Your $50 per person paid reservation includes: appetizers, dinner, dessert and complimentary soft drinks, coffee and water. Drink tokens will be available for purchase for a selection of beer, wine and the evenings signature drink. Attendance capacity is limited to first 500 paid and received reservations so order your reserved seats now (21 and over only). Purchase a raffle ticket for a chance to win a 2019 Kia Forte! Only 1,500 tickets available - Need not be present to win. AA Meeting, 10am, New Life Foursquare Church, 1090 N First Avenue, Stayton. Dia de los Ninos - Children's Day Celebration, 5pm, Stayton Public Library E.G. Siegmund Room, 515 N First Avenue, Stayton. Join us in celebrating literacy across cultures with activities, treats, and a performance by comedian and musician, Angel Ocasio. This program is for children and families. A Melodrama by Billy St. John - Directed By Shannon Rempel. All aboard the H.M.S. Majestic for a riotous adventure in this full length melodrama set in the Roaring Twenties! Little does our heroine, the heiress Merry Ann Sweet, know that she is the intended victim of the villainous Snively Swine’s kidnapping plot. With his partner, the slinky and exotic Aracnia Webb, Swine disguises himself as Sir Reginald Rottentot, a British nobleman, in order to gain the confidence of Merry and her flapper friends, Mitzi, Ritzy, and Ditzy. But Merry falls for the handsome waiter, Cary De Mille. Poor Cary — he loves Merry, too, but ship’s policy says he can’t get involved with a passenger. Must these two ships pass in the night? Not if Merry’s flapper friends can help it! Together, they transform Merry from a shy young lady into a red-hot jazz baby. Meanwhile, Swine launches his kidnap scheme. It’s sink or swim for Cary. Can he save Merry and stay out of Aracnia’s clutches? It’s up to the passengers — movie star Mary Pickaxe, gossip columnist Hedda Hooper, detective Willy Ketchum and more — to help Cary put the damper on Swine. Your cast and audience will go overboard in their enthusiasm for this rollicking production! You will receive an order confirmation by email. Please print, or display on your phone, along with photo ID, to redeem your tickets in purchasers name at the door. Ticket purchases are not refundable. All transactions are securely processed by PayPal but you do NOT need a PayPal account. Neither Aumsville Community Theatre or staytonevents.com will receive, or have access to, your credit card information. 100% of net ticket sales on staytonevents.com go to event organizers. Any fees that may be included in the online price are at the election of the event organizers to help cover PayPal and credit card processing fees. Baby Time!, 10:15am, Stayton Public Library E.G. Siegmund Room, 515 N First Avenue, Stayton. Give baby a taste for early literacy through movement, songs, rhymes and play. This program is intended for infants up to 18 months and their caregivers. Calvary Lutheran Church Team - Global 6K for Water, 10am, Calvary Lutheran Church, 198 Fern Ridge Rd., Stayton. The Global 6K for Water is held in various communities all over the world - on the same day. It is sponsored by World Vision, with the goal of creating awareness of the need for clean water, and with much of the entry fee going towards putting in wells. The distance is symbolic: it is the average distance a child walks to an often contaminated waterhole to fill a jug for family use. The event is open to the public to join the local Calvary Lutheran Church Team. Entry fee is $50 per adult and $25 per kid under 18. Registrants receive a 6K t-shirt and race bib in the mail. Must register online at www.worldvision6k.org Currently, two team members plan to run and the rest to walk. For more information on the local team contact Captain Shane Fritz at 541-571-0300. May the 4th Be With You, 4pm, Stayton Public Library E.G. Siegmund Room, 515 N First Avenue, Stayton. An all ages event with fun projects and activities to satisfy the Star Wars fan! Gallery Showing, 7pm-9pm, Aviation and Landscape of Craig Randall, Stewarts Hall, 158 SW Broadway, Mill City. Free admission, Adults Only. Join Santiam Hearts to Arts at Stewarts Hall as they highlight another of the artists of the North Santiam Canyon. Featured artist Craig Randall is a fifth generation Elkhorn Valley resident. The evening is open to any and all art lovers and supporters 21 and over as adult refreshments will be served. This event is part of Santiam Hearts to Arts' celebration of over 10 years of serving the North Santiam Canyon, and the first gallery showing in their new home. Best home made biscuits and gravy in the valley! Breakfast also includes: Scrambled Eggs, Hashbrowns, Fruit, Coffee and Orange Juice. Adults $7, Kids (6 thru 12) $2, Ages 5 and under Free. Bring the whole family and come out and enjoy a great breakfast while meeting with some old (and new!) friends. It’s an ALL YOU CAN EAT AFFAIR. Proceeds help support K of C community projects. St. Boniface Archives and Community Museum, Open 9am-12pm (first Tuesday of every month). St. Boniface Archives and Community Museum, 371 SE Main Street, Sublimity. No admission charge. Learn about Sublimity's history, and maybe even your own family genealogy, through archived documents, photos and conversation with knowledgeable volunteer staff. Coffee and cookies always available. The museum can be open on other days (except holidays) by special request. Contact Charlene Pietrok Pierce by phone or text at 503-508-0312 to schedule a request. Lyons Garden Club Annual Field Trip, begins with a no-host lunch at Macleay Country Inn, 8362Macleay Rd SE., Salem at 11:30am. Meet at the park 'n' ride in Stayton at 10:45am if you wish to carpool. After the luncheon they will proceed to Godfrey’s and Wavra’s nurseries to see greenhouses and buy flowers. If you wish to attend or would like more information please contact John Hollensteiner 503-508-5913 or Cheryl Cappelletti 503-767-3348. Dungeons & Dragons, 5:30pm-7pm, Stayton Public Library E.G. Siegmund Room, 515 N First Avenue, Stayton. First timers or experienced players welcome! For ages 12 thru adult. Lego Build It! Da Vinci Days, 4pm, Stayton Public Library E.G. Siegmund Room, 515 N First Avenue, Stayton. Come build inventive creations inspired by the work of inventor/artist Leonardo Da Vinci. This program is for children and family members of all ages. DIY Craftshop: Black Glue Watercolor Roses, 5:30pm, Stayton Public Library E.G. Siegmund Room, 515 N First Avenue, Stayton. We’ll be using a technique to use black glue and watercolors to create rose art. For ages 12 thru adult. Free, supplies provided. Register at the library or call 503-769-3313. A wide variety of both new and used items - floral decorations, craft and sewing supplies, books, toys, household items. Most clothing is $1or less. Proceeds are used to sponsor 5 elderly people in Guatemala and Nicaragua. Stayton High School FFA Annual Plant Sale and Car Wash, 1pm-5pm, Stayton High School, 757 W Locust Street, Stayton. A variety of mixed and petunia hanging baskets will be available, as well as veggie starts, succulents and annuals. Look for the car wash in the parking lot at the east end of the school and follow the signs to the greenhouse located behind room 604. Pick up some trash today anywhere you might see it and dispose of it properly. If today doesn't work for you, tomorrow's good too. Stayton High School FFA Annual Plant Sale and Car Wash, 10am-4pm, Stayton High School, 757 W Locust Street, Stayton. A variety of mixed and petunia hanging baskets will be available, as well as veggie starts, succulents and annuals. Look for the car wash in the parking lot at the east end of the school and follow the signs to the greenhouse located behind room 604. Marion County Commissioner’s Breakfast, 7:30am, Covered Bridge Café, 510 N Third Avenue, Stayton. A member of the Marion County Board of Commissioners meets monthly with local officials and any interested citizens. The purpose of the meeting is to exchange interagency and regional information. Meetings are open to the public. Santiam Historical Society Meeting, 6pm, Stayton Public Library E.G. Siegmund Room, 515 N First Avenue, Stayton. Refreshments will be available and the public is welcome to attend. Stayton Library Board Meeting, 6pm, Stayton Public Library E.G. Siegmund Room, 515 N. First Avenue, Stayton. Meetings of the Library Board are open to the public. The Friends of the Scio Public Library will hold its Annual Book Sale this weekend. Thousands of books are available, as well as DVDs and audio CDs. All books cost $1. On Saturday from 1pm to 3pm will be a bag sale, you can fill a grocery bag with all of your favorite authors for $3. The proceeds from the sale support adult and children’s programs at the library. There are thousands of really great books; so come out and shop with us. For more information, contact Wendy at 503-394-4266. Paws to Read, 4pm, Stayton Public Library E.G. Siegmund Room, 515 N First Avenue, Stayton. Share stories with Willow the therapy dog! This program is for all ages. "Approaching Frankenstein through the lens of Mary Shelley's Gothic biography", 7pm, Stayton Public Library E.G. Siegmund Room, 515 N First Avenue, Stayton. Collette Tennant, English Professor from Corban University, will be presenting on Mary Shelley’s Frankenstein. This program is part of Stayton Reads, presented by the Stayton Public Library Foundation. Endangered Species Day Puppet Show, 3:30pm, Stayton Public Library E.G. Siegmund Room, 515 N First Avenue, Stayton. Come enjoy stories, songs and our puppet rendition of the children’s book Big Bear Hug by Nicholas Oldland. This program is for all ages. Local Author Fair, 11am-3pm, Stayton Public Library E.G. Siegmund Room, 515 N First Avenue, Stayton. Come meet your local literary talent and enter to win prizes. Readings will happen throughout the event. Books will be available for purchase and signing. Pioneer Park Masonic Monument 30th Anniversary Re-Dedication, 12:30pm, Pioneer Park, Stayton. Public is invited to join with the members of Santiam Lodge #25 Ancient Free & Accepted Masons for a re-dedication ceremony celebrating the 30th anniversary of the Masonic monument placement at Pioneer Park. The Monument was put in place 30 years ago to commemorate the gift of the land on which the park was built. On October 26, 1936, the Santiam lodge #25 Ancient Free & Accepted Masons donated the land to the city of Stayton for Pioneer Park. Light snacks will be served from 12:30pm and the ceremony will begin promptly at 1pm. District Deputy Grand Master Right Worshipful Brother Ken Anderson will preside over the ceremony. Upcycled T-Shirt Totes, 5:30pm, Stayton Public Library E.G. Siegmund Room, 515 N First Avenue, Stayton. Bring an old t-shirt to turn into a tote bag! For teens in grades 6 thru 12. Maker Lab: Bots!, 4pm, Stayton Public Library E.G. Siegmund Room, 515 N First Avenue, Stayton. Come explore the world of simple programmable robots with Cubelets and Ozobots! Although this program is best for third grade and up, younger ages are welcome with adult supervision. Materials used for this program made possible by LSTA/IMLS and the Independence Public Library. Kathleen Dean Moore - Stayton Public Library Author Visit Series, 7pm, Stayton Public Library E.G. Siegmund Room, 515 N First Avenue, Stayton. Kathleen Dean Moore is a philosopher, writer, and environmental activist from Oregon State University. Her recent works are on the moral issues of climate change. A reception for the author will accompany the presentation. Book Discussion - "Love and Other Consolation Prizes", 5:30pm, Stayton Public Library E.G. Siegmund Room, 515 N First Avenue, Stayton. Join us for our monthly book discussion group for adults. This month’s book is Love and Other Consolation Prizes by Jamie Ford. Chip timing provided by Eclectic Edge Racing. Prizes awarded to first place male and female runners in all age divisions. Keepsake prizes to all finishers. Two $150 Stayton Sports Gift Cards raffled to entrants (must be present to win). Come join us for health and fun! Kids zone with snow cones, bouncy house and face painting. Adults enjoy fresh fruit & scones, coffee, smoothies... and even a complimentary beer sample from Snow Peak Brewing! (21 and over only*ID Required*). While waiting for the awards after the course closes at 10:30am, listen to music, visit the food truck and stop by the staytonevents.com booth and spin our prize wheel for a treat! You won't want to miss this 30th Annual Fun Run! 9:30am - Grand Marshall Recognition and Gary Bates Scholarship awarded. 9:30am - Children’s Special Classes followed by Lamb Judging with Breed show & then market classes. Great variety of vendors with seasonal plants and produce (as available), retail products, crafters, artisans, yummy snacks, yard art, food trucks and more! Always something for everyone. Proceeds from vendor fees help support Aumsville PARC programs for area youth. Vendor registration available now. 12x12 spaces only $20. An adventure for dogs and their owners! The Canine Adventure Course consists of 20 novel obstacles which the dog and owner negotiate and complete together. It is a non-competitive sport, focusing on teamwork between dog and owner, and most importantly, having fun. The course is completed ON LEAD, allowing dogs of all training abilities to join in. Each dog and owner navigates their way around a numbered course, and work as a team as they encounter each obstacle. Hay bales, agility equipment, splash pools, mazes, tires and logs are cleverly designed and put together as novel obstacles. Climbing up, stepping over, crawling through and diving in are all fun techniques each dog can use. Plenty of rewards, praise and encouragement from their owner gives each dog confidence, builds on trust and teamwork, and ultimately leads to a fabulously fun and exciting time for all. Dogs and owners have the opportunity to complete the course three times as a team. One-hour sessions are available throughout the day. Time slots start at 11am. Cost is $20 for 3 rounds taking approximately 1 hour. For more information contact peggy@peggyspawsitivepaws.net or call 503-602-8507. 10k/3k Runs, 3k Walk, 5k trail run. Both the runs and walk of this event will take place on both asphalt and cross-country surfaces. The miles are marked and the courses are excellent for the competitive runner, fun runner and walker and will use chip timing. Ribbons will be awarded to the top three male and female finishers in five-year age-groups in each race, top six male and female finishers overall in the walk. Prize for the most patriotically dressed runner and dressed family! National Night Out - BBQ in the Park! approved in advance by City of Sublimity. Yes, it's our 41st! Get together with old friends and classmates from Regis as well as invited past mates from St. Mary's, Sublimity and Lourdes Elementary Schools. Yes, it's our 41st! Get together with old friends and classmates from Regis as well as invited past mates from St. Mary's, Sublimity and Lourdes Elementary Schools. Check back here for updated reunion details, or please RSVP to 1978regisrams@gmail.com to receive direct email updates. Check back here for updated event details later. Contact us NOW about getting your organizations informational blurb posted below for 2019. Organization dedicated to supporting Stayton Public Library programs through volunteer fundraising efforts. New member volunteers are always welcome to help staff semi-annual book sales, Friends of the Library Used Book Store, and other events. If you are interested in joining FOL please contact Carol Tabor at 503-769-8886 or staytonfol@gmail.com or come to a monthly meeting found posted on the Local Area Calendar of Events. We are a small local theatre group run by and for community members. Join our theatre family! Actors and volunteers of many types welcome and needed. Performances are currently held at The Little Red Schoolhouse Theatre in Stayton. Current auditions, show information and advance tickets can be found on the Local Area Calendar of Events. For more information contact President Shannon Rempel at aumsvillecommunitytheatre@hotmail.com or visit their website>>. A non-profit, non-political volunteer women’s service organization that continues to promote historic preservation, education and patriotism since its formation in 1890. Members of Abigail Scott Duniway Chapter, support and recognize youth, first responders, active duty military, and veterans groups; promote literacy and citizenship for children and adults; and actively engage in conservation, preservation of historic places, genealogical research, and patriotic events. Sublimity Quilters was organized in 1978 to preserve and encourage the art of quilting, provide a social function for quilters and accomplish charity work related to quilting and comforters. Recipients of our charity projects include Regis High School Auction, St. Boniface Parish, area school carnivals and auctions, Birthright of Salem and victims of fires or poverty circumstances. Weekly meetings and activities can be found on the Local Area Calendar of Events. There are no dues to join and new members are always welcome. Contact Audrey Sherman at 503-510-2839. The Lyons Garden Club was established in 1950 and continues today with monthly meetings at the Lyons Fire Department Conference Room in Lyons. The club has members from Stayton, Lyons, Mill City, Mehama, Scio and Sublimity. Monthly meetings and activities (except for July and August when no meetings are held) are open to the public and can be found on the Local Area Calendar of Events with full information. The club has an annual road trip outing which includes lunch out and visiting various nurseries or gardens and a yearly potluck picnic usually held at one of the club members home, and an annual Christmas lunch and gift exchange. Club dues are $12 per year, beginning in January. Dues includes a yearly planning and information booklet and name badges. For more information or if you wish to join the club, please contact President John Hollensteiner, 503-508-5913 or Cheryl Cappelletti 503-767-3348. Santiam Hospital Auxiliary was established in 1950 and is dedicated to supporting Santiam Hospital, its staff and the community. The volunteer Auxiliary administers an annual Medically Oriented Scholarship Program and supports and assists the hospital, and the various departments in the hospital, which can make requests for supplies and equipment they might need for improvements. The Auxiliary currently has four major fundraising activities including: Easter Tulip Sale; Harvest Festival Breakfast; Fall Fashion Show; Christmas Poinsettia Sale. The Auxiliary is always interested in any suggestions to improve the Auxiliary and for new members. The Auxiliary meets quarterly and dues are only $10 per year or $100 for a lifetime membership. Meeting and activity information for the Auxiliary can be found posted on the Local Area Calendar of Events. If you are interested in becoming a member of the Auxiliary please contact President Pat Spaeth at 503-769-3381 or Vice President Mary Lou Hazelwood. Meetings are held quarterly. Meeting and activity details of the Auxiliary can be found posted on the Local Area Calendar of Events. Santiam Hospital Auxiliary Gift Shop is located in the main lobby and is open to the public. Gift shop hours are: Monday-Friday 9 am to 5 pm. Mary Duncan and Deb Meyers are Gift Shop Coordinators. The shop features a selections of various items, including holiday gifts. The Knights of Columbus St. Anthony Council is a fraternity of Catholic men dedicated to performing good works in our local community. We show love for our neighbors by conducting food drives and donating the food to local soup kitchens and food pantries, by providing food to families in need during the holidays, by volunteering at numerous community events, and by supporting, both spiritually and materially, mothers who choose life for their babies. The four major credit reporting agencies sell lists of accounts to hundreds of banks for direct mail solicitation. You can have your name removed from these lists by a simple phone call. Just follow the menu and answer a few pre-recorded questions. open to all events large or small, of interest to the general community. We reserve the right to edit or not publish any submission. Not responsible for errors, omissions or schedule changes. This website, and all images and content on this website, are copyright protected. Unauthorized use, including copying, printing or republishing in any manner, is strictly prohibited.